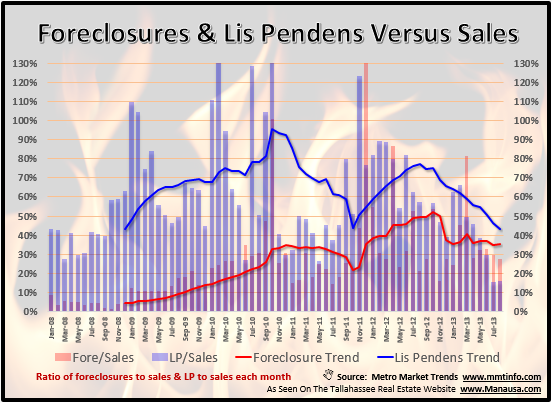 New lis pendens filings in Tallahassee rose 11% in January when compared to January 2012, and foreclosures fell 36%. The rise in new lis pendens filings is a concern, as we had three straight months of declines and were hoping the market was finally seeing progress in the resolution of distressed properties. The blue line in the graph below shows that 1/2 of all filings are ending up in foreclosure sale, indicating that they are likely being sold as short sales with the approval of the bank.